Magnesium is a dietary mineral that is responsible for 325 enzymes regulating energy production, muscle strength, recovery, immune system, nerve cell function, blood pressure and hormones. Deficiencies can lead to poor sleep quality, anxiety, muscle cramps, fatigue, poor skin quality and headaches. Magnesium is an essential dietary mineral that performs a number of critical functions and 300 biochemical reactions in the body. Without magnesium there is no energy, no movement, no life. Most of us are deficient in magnesium to some degree. A government study conducted shows a staggering 70% of Americans do not consume the recommended daily intake of magnesium. Magnesium deficiencies are the leading cause of many illnesses and health issues like fatigue, muscle soreness or cramps, insomnia, high blood pressure, migraines, chronic headaches, backaches, overactive bladder, menstrual cramps. anxiety, depression, insomnia, irritability, and weight gain. Conversely, if you are deficient you may end up developing these issues. In the modern world, we don’t get as much magnesium through diet as we used to. Modern industrial farming depletes the soil of magnesium, food processing removes most of the natural magnesium from food, boxed foods, vegetable oils, white flour, sugar and high fructose corn syrup are all completely devoid of magnesium. You become magnesium deficient slowly through time. Magnesium is excreted through urine if you eat sugar and salt, or drink alcohol, coffee, or tea. Magnesium is lost if you are under a lot of stress and if you exercise and/or sweat a lot. Deficiency has no single symptom and it is very difficult for your doctor to test for a magnesium deficiency. Prominent sources of magnesium can be found in: Whole grain oats, buckwheat, lima beans, green beans, black beans, soybeans, spinach, bananas, avocado, blackberries, dates, figs, pumpkin seeds, watermelons, almonds, cashews, hazelnuts, yogurt, shrimp and tuna. 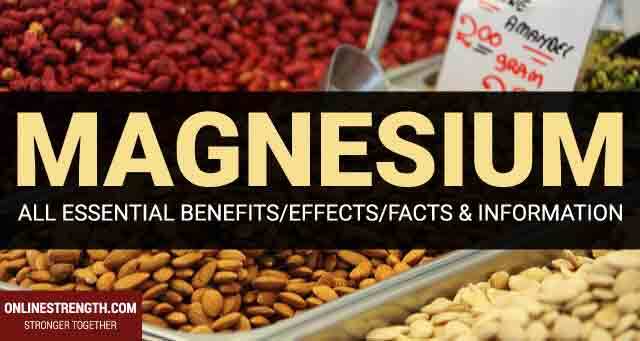 Magnesium supplementation is also a very effective and safe way to increase daily magnesium intake. Magnesium oxide – Cheap, not effective, and poorly absorbed. Common, cheap, poorly absorbed. Can cause unnecessary bloating, gas, and diarrhea. Don’t use this form. Magnesium chloride – Found in topical oils. Can applied and absorbed through the skin. Magnesium citrate – Effective, affordable, good all-rounder, prevents kidney stones & constipation. Magnesium gluconate – Less likely to cause any bloating, gastrointestinal issues or diarrhea. Safest and best option for correcting long-term deficiency. Magnesium glycinate – Less likely to cause any bloating, gastrointestinal issues or diarrhea. Safest and best option for correcting long-term deficiency. Magnesium malate – Helps fibromyalgia, fatigue, energy, muscle soreness, recovery, lean muscle growth, muscle cramps and pain. Magnesium taurate – Helps cardiovascular health, depression. Easily absorbed and contains no laxative properties. Magnesium aspartate – Don’t use this form. Magnesium glutamate – Don’t use this form. Shoot for a total of 600 to 900 milligrams per day including food, liquids and supplements. Try not to take more than 300 mg at one time, spread your dose throughout the day to minimize loose stools or diarrhea. If you are deficient it can take weeks to months to restore your magnesium supplies. Be patient. RDA (recommended daily allowance) of 320 to 420 mg per day. However the correct dosage for you may be a little different. RDA of magnesium is calculated 6mg/kg per day. so 420 mg is the estimate for a 154 lbs (70 kg) male, hardly the current average. A 250 lb. male needs 678 mg per day. You should strive to reach a total of 600 to 900 milligrams per day including food, liquids and supplements. A good high quality magnesium supplement typically contains 300 mg of magnesium per serving. Supplementation of that once or twice a day will meet the daily recommend magnesium intake and provide extra muscle recovery, healing, repair, and special needs benefits. Avoid taking more than 300 mg of magnesium at once, spread out your dosages throughout the day to minimize loose stools or diarrhea. More than 70% of Americans are magnesium deficient. You should strive to not be one of them. There is literally zero reason to be dipping into the deficiency category. Especially with magnesium supplements being so easily available. If you know you’re not eating a enough nutrient dense foods EVERY day to maintain proper humanly function, do yourself a favor and purchase a magnesium supplement. The consequences of being deficient aren’t worth it. Magnesium is very well researched and its extremely safe to supplement. If you are not getting enough magnesium you’re literally operating at a lower level. You make the decision. Maintain proper health or live sub-optimally.